Car Rental Icons is a vector pack of 68 unique vector glyph icons that can be used for different purposes, such as car rental websites and advertisement. 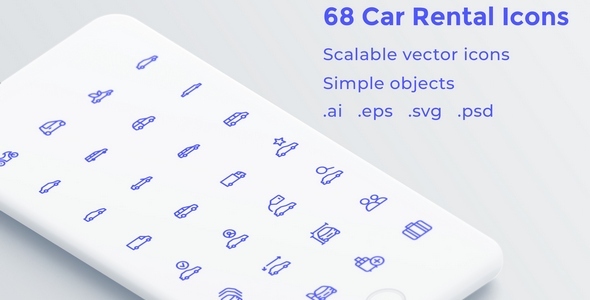 Car Rental Icons is a vector pack consisting of 68 unique vector glyph icons of 4 types: glyph, glyph+color, glyph+circle+color, and outline. Files structure is fully organized to make the editing process easier for end-users. The pack contains various cars icon types covering search process, booking, renting or purchase of cars, extras, car parts, etc. It can be used for different purposes, such as car rental websites and advertisement. We recommend to download and install these fonts before editing your PSD files.